Cartoon and Gol-Mohammadi are mirrors of a society. They put religious superstitions under scrutiny. Islam and tyranny have been twins for many centuries. We will quote an extract from Chronicles from Iran published in 2012. A text written in 2006, when the first episode of “Islam versus Cartoons” was unfolding. Satire and cartoon are mirror images of a society and put religious superstitions and dogma under scrutiny. Islam and tyranny have been twins for many centuries now. Time is ripe to question what is believed to be the traditions that gives power to the men of no faith and an excuse to the abominable behaviours from no-hopers. a crowd of protesters shouted in Islam-istan brandishing the Koran. The fault in it springs from our Muslimhood. I was going to organise a festive party despite having the episode of general mourning to observe. In the months of S̥AFAR, the commemorations of religious assassinations are countless, (Ashoura and Arbain). In my childhood, there was a time when the bereavements of Emâms who had died more than a thousand years before had to be observed as if we had just lost our mother. An expression of joy, even in private, was a deviation worthy of a stern rebuke. In bigoted families, which ARE in excessive numbers otherwise the Islamic Republic would have not lasted for the last thirty years, children, as well as adults, had to wear black and wail to order. Laughing, squabbling, and playing cops and robbers were forbidden in these two successive months of general mourning. It was, as it is today, a public display of weepy hypocrites. Shiites got together looking gloomy. Being merry was forbidden: no more âdjil, no more sweetmeats. Watching the TV or listening to music was something like breaching all the Ten Commandments at once. Cinemas closed. I have overpowering memories of suffocation from these episodes. In Shiite families running a wild life, the only way out of this collective punishment was to take refuge in Christian or Sunnite families. The months S̥AFAR were and are prosperous months for the ÂKHONDS to make dough, exactly in the same way as in the weeks before Christmas for businesses in the West. ROWZ̥AHS and NAZ̈RS, symbols of superstition and ostentation to Shiite Iranians, followed steadily one after the other. Organising families competed in gaudiness. ÂKHONDS moved on ceaselessly from one homestead to the next. The bigwigs of the clergy officiated at the homes of VIPs and received cash or a supply of favours for rainy days; the half-mullahs freshly named, the DJOUDJAH ÂKHONDS, satisfied themselves with a free lunch and a tip from poor families. 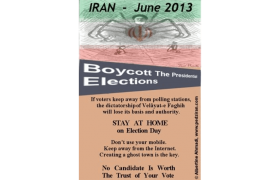 Thanks to the paradoxes of the Most Shiite Islamic Republic practices are changing. In private circles the harshness of mourning has greatly diminished in the months of MOḪARAM and S̥AFAR: today parties, MEHMÂNIS, with ÂDJIL and sweetmeats are fashionable. In the streets and public places, despite an apparent rigour, people become slack. Later in the week, I would have plenty of guests at home. I hoped that I had not forgotten someone, a cousin or an aunt. For a classy party, European style made pastries, so called Danish, DÂNMÂRKI, are preferred. I went to a highly rated and chic shop to buy my SHIRINIS DÂNMÂRKI. At the counter, the word was crossed through but it was still legible; under it Gol-Mohammadi was added. The she-client before me was groomed to perfection: lips and nose transformed by a cosmetic surgeon, wearing an Islamic manteau so tight fitting that all her folds and love handles could be appreciated at their true worth. She ordered two kilos of an assortment of DÂNMÂRKI pastries. The head baker corrected her softly: “Dear Madame, they are Gol-MohammadiS.” The she-client’s reply was scathing; a volley of criticisms of the head baker and the craze of the Muslim world. There was a time when the Iranians had a sense of humour and the gift of self-derision. Today, edginess and aggressiveness have replaced the laughter and complicity that made life pleasant. 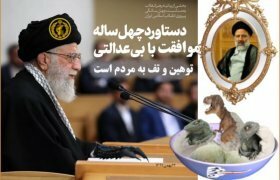 Now, behind every shop counter, the stern portraits of Supreme Guides, Khomeiny and Khamenei, remind one that times have changed and that many are fed up finding Islam everywhere, even in their plates. On my way back home, I thought of an expert from a western satellite TV channel who had pontificated on the symbolic seriousness of Muhammad’s cartoons for a Muslim people. I gave up, the same way as the head baker had. Europe abounds in too many formatted analysts, experts in a given country of which they overlook the population, the language or the mentality. The campaign for Gol-Mohammadi was an act of media propaganda as childish as that of “freedom fries” set up by a congressman or woman in Washington. Upset by the refusal of the French to take part in invading Iraq in 2003, a republican congressperson had campaigned to change the name of ‘french fries’ in the United States to ‘freedom fries’. Stupidity is not exclusive to the Islamists. The rednecks in Washington do as well; crafty bigots always identify with their own kind. By the end of September 2005, a regional Danish paper, Jyllands-Posten published twelve cartoons having for their subject Muhammad and the Muslims. They went unnoticed. Islamists had to hustle and bustle for about three months to get their file through the milieu of international Muslim politicians. The Arab League took its time to protest. The Organisation of the Islamic Conference (OIC) mentioned it in December. By early January 2006, the Arab League and the Danish government were having some diplomatic exchanges, waffling, en langue de bois. Around the tenth of January, a Norwegian weekly reprinted the twelve cartoons; worldwide protests sparked off. The Islamists raised their voices and cried blasphemy, vengeance, hatred, death. The European media, irritated, endorsed freedom of speech loudly and strongly. OIC added to the blast with heavy cannons: acts of Islamophobia, violation of United Nations’ declarations, breach of the International ethic. The official statements of dictatorships of Islamic countries followed one another: Jordan, Saudi Arabia, Kuwait, Yemen, Libya, Syria. February 2006 was the month for all deceitfulness. In Paris, the daily France-Soir published the cartoons; its director was dismissed. Other media abstained from publication or hesitated to publish. Attacks on Danish and Norwegian diplomatic offices and commercial buildings started in Syria, and spread to Libya, Pakistan, Afghanistan and elsewhere in the Muslim dictatorships. Under the eyes of the international media, embassies, consulates, banks, shopping centres and cars were set on fire. Churches and Christians were assailed. Protesters outdid one another, rowdy crowds competed in chanting slogans full of hatred; some were killed, others wounded, Muslims were trampled by other Muslims. With fire and blood in the background, bearded faces expressing the ugliness of violence were repeatedly shown on TV headlines. The media raced out of control when an Italian minister showed up, wearing a T-shirt imprinted with one of the cartoons. Most politicians, European and Middle-Eastern, recoiled from the force of the so-called spontaneous protests. Calls for discussion and dialogue flourished. There was much ranting about the freedom of the press. OIC distanced itself from the Islamists: the death fatwas for the cartoonists were contrary to Islam. In the haste, European governments started financing chaotic projects for dialogue between religions. 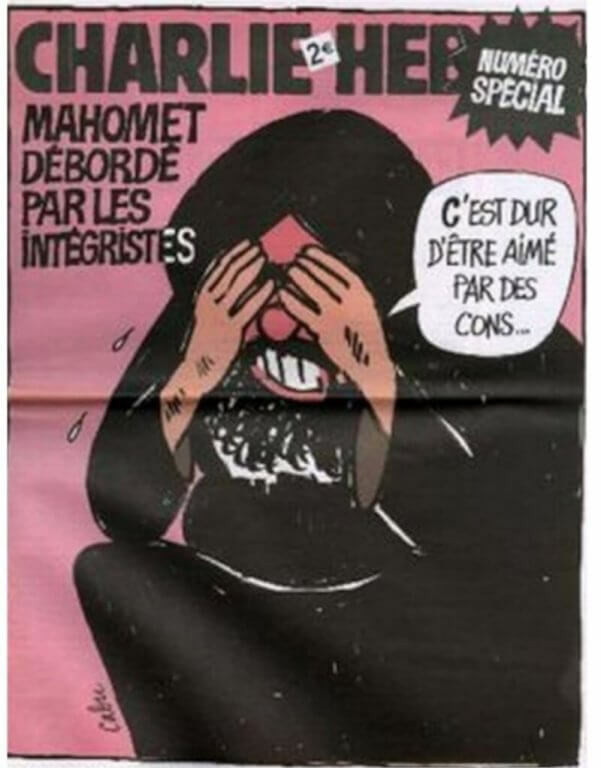 In a deafening cacophony, the European media regretted the publication of the images or awarded the cartoonists. Little by little, the diplomatic langue de bois, and mollifying statements got the upper hand. Six years have gone by, the fire smoulders all the same. It will revive when the Islamists feel a need for it. Europeans are cornered and on the defensive. The proven mediocrity of politicians since the last part of the 20th century is blatant. 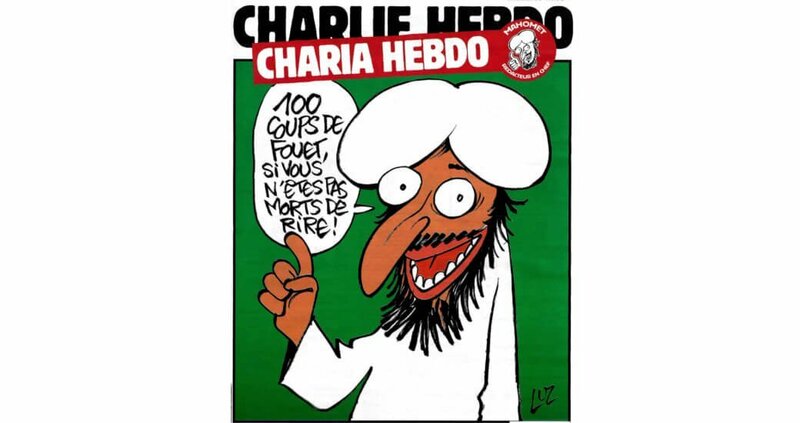 The saga of the Muhammad’s cartoons is, on its own right, a caricature of international politics. On the one side, there are the Islamists, frightfully efficient in manipulation. On the other side, there is the clique of American extremists who, since 2001, have not stopped talking of the War of Civilisations, the Axis of Evil and Muslim terrorists, followed, willy-nilly, by a large number of Europeans. Today, 2011, the “Arab Spring” brings hope to many. The road is, however, long for empathy on all sides. Europe was trapped in the story, believing misguidedly that claiming freedom of speech would speak in its favour. In giving rough and ready peremptory legal answers to outrageous complaints, politicians sat on their hands and facilitated the task of the Islamists. The freedom of speech received a nasty blow, since the formatted media and journalists as untaught as their elected representatives greatly contributed to worsening the situation. There were not too many people heard to say that in the subconscious of a Muslim, haunted by decades of tyrannical censorship, the press is the State’s spokesman. For a Muslim when a western government brings up freedom of speech, it just ducks its responsibilities. This saga did little for everyone’s reputation. Bad faith and dishonesty played their part in the West as much as in the Muslim countries. The xenophobes in the West fuelled the fire to advance their domestic political scheme. In organising violent protests, the Islamists took advantage of the freedom of speech in Europe to spit on that same freedom of speech. In January 2006, the ayatollahs of Tehran stayed self-restrained on the issue. The Iranian papers, mouthpiece of the ÂKHONDS, just reported the international protests; they did not underline the affront to Islam. Anyhow, many couldn’t care less. Those who had actually seen the cartoons found them childish, of bad taste; among Iranians, the jokes on the ÂKHONDS and the drifts of religion are, on the contrary, deliciously scathing. Since in February 2006, the Iranian nuclear file resurfaced once again at international level and the Islamic Republic linked, little by little the affront to Islam with the absolute right of Iranian people to possess atomic energy. 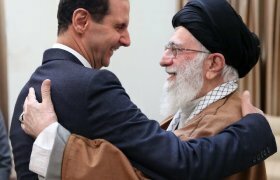 But anyone could see right through the manipulation and the damp squib of the Islamic Republic made one either laugh or grind one’s teeth. In anticipation of the 11th of February, the celebration day of the victory of the Islamic Revolution, the ÂKHONDS tried to warm up their fervent followers. On the 6th of February, the popular masses, so-called students flanked by BASSIDJIS set fire to the Danish and Austrian embassies in Tehran. Not only were the protesters paid individually, but also with the IAEA having its offices in Vienna, the Islamic Republic had to puff up its muscles. Cabu, the artist, and Kayyam the poet, would have many idea to share if they were contemporaries. Cabu was assassinated by men of crass ignorance. Kayyam doubted the existence of divine providence and the afterlife, derided religious certainty, and felts keenly man’s frailty and ignorance. He was attacked by the clergy for his scepticism.